“Early Edition,” anchored by TJ Manotoc and Annalisa Burgos, debuted last Monday (Feb 27) to deliver the latest news, financial updates, and breaking news reports as early as 5:30 am from Monday to Friday. The fast-paced news-oriented program also features veteran broadcaster Paolo Abrera and ANC news correspondents Michelle Ong and Christian Esguerra to help TJ and Annalisa in arming viewers with significant and relevant information and analysis that they can use as they face another busy day ahead. To add spice in the morning, “Early Edition” will also have sports, lifestyle, and entertainment news, and live discussions on the trending topics in the country and in the world today. Resident ANC analyst Richard Heydarian will also be there to explain and dissect issues on foreign relations and foreign policy. There’s a new morning show on ANC, the ABS-CBN News Channel to jumpstart our day with the top news and business stories in the country and around the globe. The show formally introduces Annalisa as the newest anchor of ANC, considered as the gold standard in news and analysis in the Philippines. The Los Angeles-born international journalist brings with her over 17 years of experience as a multi-media journalist covering news, business, and lifestyle beats in Asia, New York City, Washington, DC, and Los Angeles. 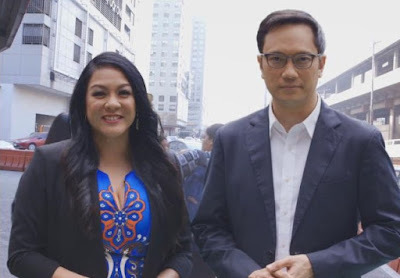 Prior to joining ANC, Annalisa was an anchor and lifestyle correspondent for Channel NewsAsia's regional English-language morning show "FirstLook Asia," where she got to interview global newsmakers. She also hosted a popular weekly food and travel series "What's Cooking,” covering topics like luxury travel in Japan, fine dining on the Mekong River and sustainable farming in Central Vietnam. Before moving to Asia, Annalisa was a New York-based anchor, reporter and editor for several major media companies, including Yahoo, HGTV, Forbes, CNBC and Bloomberg. She graduated from UCLA and Columbia University's Graduate School of Journalism. Aside from “Early Edition,” she also fronts “News Now” on ANC at 10am and 11am. Catch “Early Edition” on ANC and ANC HD from Monday to Friday at 5:30am. For more information, visit news.abs-cbn.com/anc, or follow ANC on Facebook (https://www.facebook.com/ANCalerts) and Twitter (@ANCalerts).